For this assignment, you need to write two functions. this functions must draw a tree on the screen. Use a brownish rectangle for the trunk, and a green triangle (using fillPolygon()) for the branches. 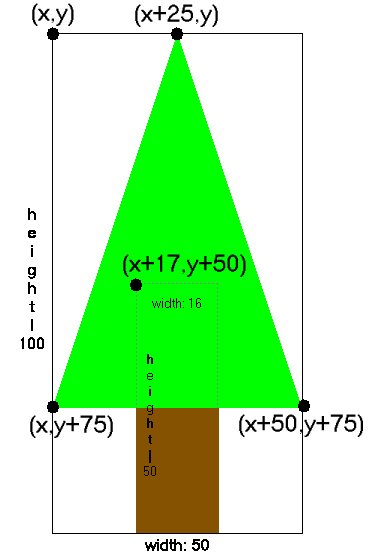 You should make it so that x is the left-most part of the branches, and y is the tallest part of the tree. You should make each tree relatively small. this functions should call the drawTree() method inside a loop in order to draw many trees within a certain region on the screen. The positions of the trees within the forest should be random, but no part of any tree should extend past the boundaries given. The diagram to the left is not to scale.